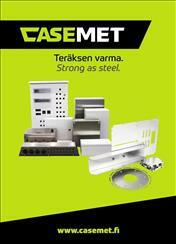 Casemet’s wide product offering includes various size standard metal enclosing solutions. Our standard enclosing solutions are designed for harsh and demanding environments and applications in the industry. IP-class IP66 and IP55 (for 2-door version). Cubo E standard enclosure range is available as plain and flanged versions with materials of polyester painted mild steel, stainless steel AISI304 and AISI316L. Cubo EO standard enclosure range is available only as knock-out flange version with material of polyester painted mild steel. Cubo F standard terminal enclosure range is available with materials of polyester painted mild steel, stainless steel AISI304 and AISI316L. From this range there are available plain-sided and flanged versions. Also a version with a window on the lid is available. In all Casemet-made painted enclosures the standard color is RAL7035, paint structure effect. The gasket we use as standard in the door is polyurethane (PUR). Broad spare part offering completes our standard enclosing ranges. Cubo E and F standard ranges comply with the requirements set in the EN 62208:2011, DNV-GL, UL 508A - Industrial Control Panels.